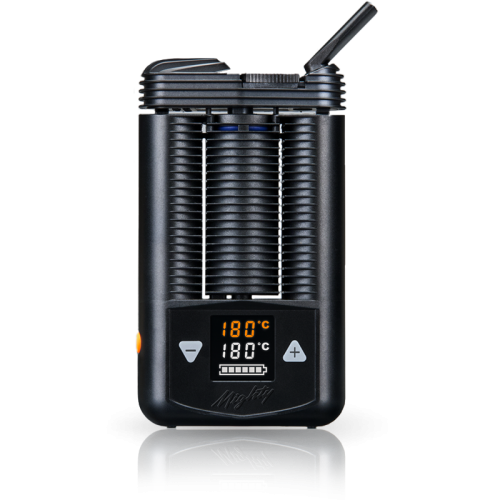 Bred from the same DNA as its smaller predecessor the Crafty, the Mighty vaporizer from Storz & Bickel is more powerful and has more precision than its little brother. 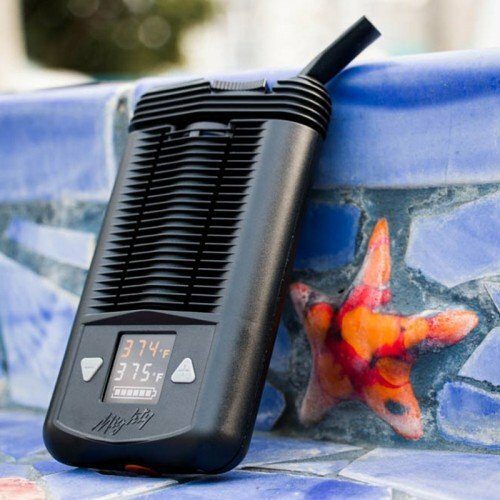 Coming from the German engineers who gave us the iconic Volcano Vaporizer, the lithium-ion powered Mighty vaporizer is the brand’s latest addition to their already extensive line of reliable and powerful vaporizers. With a large, easily-noticeable LED-display and simplistic plus/minus keys, the Mighty is a breeze to use. As soon as the actual temperature matches the individually adjustable set temp, it is ready to vaporize. And in case you can’t catch a glimpse of the temps, a quick double-vibration will gently let you know you can enjoy your vape. 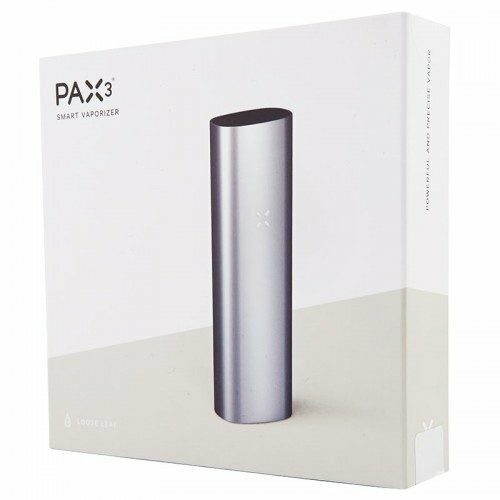 Equipped with a dual-lithium-ion battery pack and a two year warranty, this dry herb and wax vaporizer will be by your side as long as you need it to be. The Mighty vaporizer gives you the power of a desktop vape in the palm of your hand. By utilizing both conduction and convection heating the Mighty ensures there is vapor created from the first pull you take. The convection heating gives immediate and continuous vaporization, and the conduction heating ensures that there is vapor created from the initial breath. With this combo heating system, the Mighty vaporizer is able to reach its temperature quickly, without burning or scorching your dry herb. This makes the Mighty vaporizer a great option for entertaining, as the vaporizers performance is as capable during group sessions as it is during solo use. Both heating types, convection and conduction, have their pros and cons. 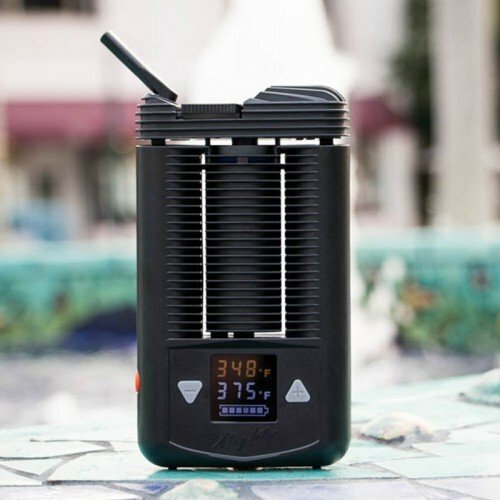 By combining both the Mighty vaporizer is an all-around heavyweight when it comes to your temperature settings. In a conduction vaporizer the heat source is in direct contact with your herbs or concentrates, meaning the overall heating process is very fast with this style of heating. Because your material is in contact with the heating element, certain parts get hotter faster so a stir or mix-up of your herb can be necessary to ensure even vaporization. Convection vaporization offers the benefit of conserving dry herb much longer than other heating methods. In a convection heated vape the area around your herb is heated, allowing it to evenly coat the surface of what is in your vaporizer. Convection is the way to go to preserve terpenes (the pungent oils that give cannabis its flavor) and if you’re looking to make your stash last, as a little pinch can go a long way. This method of heating takes the longest to heat up, which doesn’t matter for desktop vaporizers, but when you want quality pulls on the go this can be seen as a drawback. The combination heating of the Mighty vaporizer gives you a quick heat up time, and the energy of the heat transfers to the air surrounding your dry herb, allowing for herb saving and efficient convection heating. 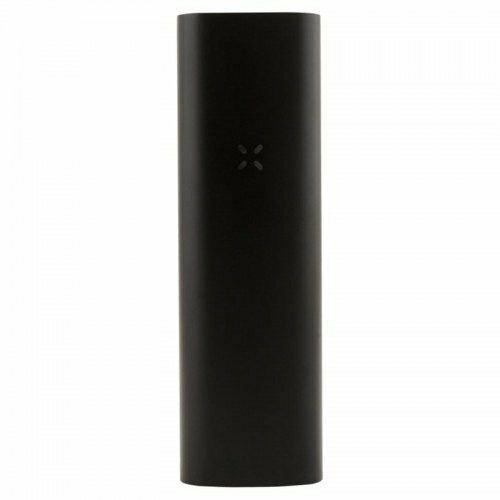 The Mighty vaporizer features a dual-lithium-ion battery that can last for up to two hours of continuous use. 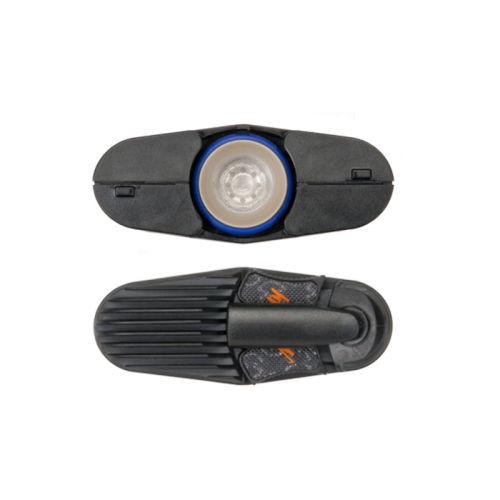 With a double-back battery you’re guaranteed a long operating life, and thanks to pass through technology the Mighty can be operated via power adaptor with completely discharged batteries. Boasting a dual-battery pack the Mighty needs a lot of charging power, so instead of a micro USB charging port the Mighty plugs into the wall. With a bright LED display and simple plus/minus buttons the Mighty vaporizer is a breeze to use. The simple and reliable operation will stand out to rookie vaporizer users as well as more seasoned vape professionals. With a dedicated button for every function, the Mighty vaporizer is one of the most useable portable vaporizers for users of all experience levels. There’s no confusing button sequencing or LED light guessing game to be played when powering up the unit or finding your preferred temperature setting. Using the Mighty vaporizer is very simple. Start by twisting the cooling unit counterclockwise and lifting to access the heating chamber. From here, load a full chamber of coarsely ground herb and lightly pack. 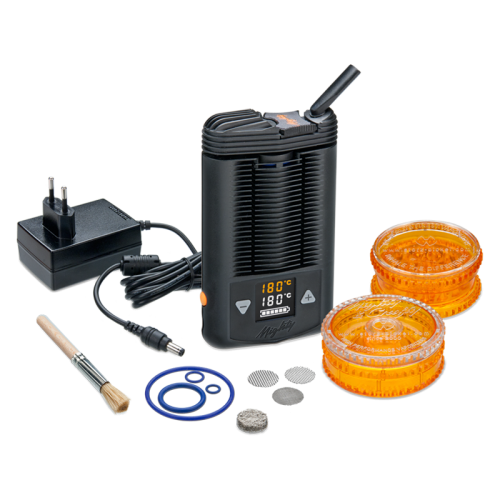 The Mighty comes with a “Filling Aid” that makes loading and unloading very easy, just load the herb, attach the filing aid, and your herb will slide into the heating chamber no problem. Once loaded, re-attach the cooling unit and activate the Mighty by holding down the side button for a couple seconds until the unit vibrates, your temperature can be adjusted using the front plus and minus buttons. When your chosen temperature is reached the Mighty vaporizer will vibrate for a second time. For a quick temperature change you can double tap the power button twice in a row. This will activate “Boost Mode”, which jumps the temperature change up about 18° F at a time, so you can finish off an oven heat session without mashing down the plus or minus buttons. After you’ve gotten the vibration confirmation that the temperature has been met, you can begin to take pulls from the Mighty vaporizer. With daily use, you’re going to need to clean the cooling unit of your Mighty about every two weeks or so. It will still work without regular cleaning, but you will run the risk of limiting your vaporizers overall effectiveness if neglected. For those who have lighter usage, a once a month cleaning session is all that is needed. To clean the Mighty vaporizer you’ll need isopropyl alcohol, some q-tips, a poker tool, and something to soak various pieces of the Mighty. The main areas you need to focus on are the heating chamber and the cooling unit. For the inside of the heating chamber, take a q-tip and lightly soak it in some isopropyl alcohol. Once your q-tip is soaked, lightly swab the inside of your chamber until it is free of grime. To ensure that no alcohol particles are left behind turn on the unit after a minute and let it run through a couple heating cycles to burn off any leftover isopropyl alcohol. After the heating unit has been tended to, it’s the cooling units turn. To separate the cooling unit slide the logo towards the mouthpiece to unlock the two parts. You can gently pull these apart and remove the mouthpiece as well. You can clean the cooling unit by soaking all the pieces in a jar of isopropyl alcohol for about ten minutes, you can go longer but don’t breach the 30 minute mark as this may wear down some of the cooling units pieces. After you’ve soaked these pieces your poker tool and q-tips will be needed. Gently swab the cooling unit with the q-tips, and let the poker do most of the work against the resin build up. It is recommended that you brush out your heating chamber and the surrounding area after each use, as this will help get out any extra particles and prep your Mighty vaporizer for its next session. As one of the largest and oldest authorized retailers of Storz & Bickel products, you can trust that VapeWorld has the latest iteration of the Mighty in stock with the most up to date firmware.